CCTV footage has been released after a Leamington FC fan was attacked during the side’s play-off win at Redditch United in April. WARNING: CONTAINS BAD LANGUAGE. During the game at the Valley Stadium there were reports of some minor problems between Redditch and Leamington fans near to the Cedar Road stand resulting in security staff being deployed there. The game went to penalties which Leamington won and a small minority of Leamington fans invaded the pitch. 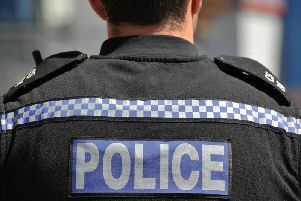 A Redditch teenager is believed to have entered the playing field and punched a Leamington fan in the face and pushed him over. The offender has been interviewed by police and is assisting with investigations. The victim left the field of play while police were dealing with this incident and has not come forward. Police are urging the victim to do so. After the match approximately 30 fans of each side were in the roadway between the ground and Bromsgrove Road goading each other, resulting in 15 officers being deployed to the area to prevent any potential problems. Anyone with information should contact West Mercia Police on 101 quoting incident number 473S of April 27.